Amazon Web Services announces AWS Toolkit for Eclipse. The initial launch of the AWS Toolkit for Eclipse is targeted at Amazon EC2 developers and provides basic management features along with tools for deploying and debugging Java web applications. 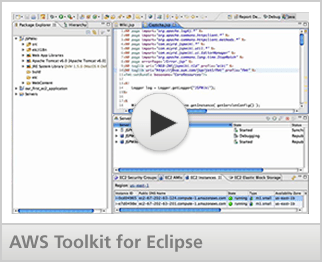 The AWS Toolkit for Eclipse, based on the Eclipse Web Tools Platform, guides Java developers through common workflows and automates tool configuration, such as setting up remote debugger connections and managing Tomcat containers. Previously, developers needed specific knowledge of several systems and manual processes to get Java web applications running in scalable configurations on Amazon EC2. The steps to configure Tomcat servers, run applications on Amazon EC2, and debug the software remotely are now done seamlessly through the Eclipse IDE. Before this step, you should Install MyEclipse 7 and Install GWT. Instatiations makes GWT Designer. It is a GUI builder that allows visual tools to generate Java code. GWT Designer does not need to be installed or used after the UI design phase. The term they use is “bi-directional code generation” meaning GWT Designer can dynamically incorporate code it hasn’t seen before, and generate new code based on your use of GWT Designer. In practice, GWT Designer lags behind the latest release of GWT, and its support for libraries such as Gwt-Ext or Gxt also lags behind. Even so, the reasonable cost of the license is enough to justify its use as an educational tool at least. If you purchase more years at one time, you get a discounted price. * If you renew your Support each year, you are entitled to technical support and all maintenance releases and major upgrades to GWT Designer. After the first year, annual support renewal costs 35% of the MSRP (currently $35). This year, the EclipseCon program features the latest advancements in Eclipse Modeling, Equinox, OSGi, RCP development, mobile development and much more. 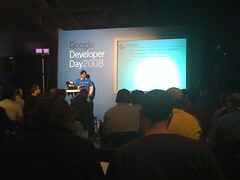 Also featured are speakers from companies such as Adobe, eBay, Google, LinkedIn and Salesforce.com. In total, the technical program has over 250 tutorials and sessions for you to choose from. EclipseCon is always a great opportunity for Eclipse members to learn, network and appreciate the diversity of the Eclipse community. The conference takes place March 23-26, 2009 in Santa Clara, CA. To review the program and to register, go to eclipsecon.org. Barriers to entry for software development have never been lower. Compare the cost of tools like MyEclipse with what was required to join Microsoft Developer Network or purchase Sun compilers. Thirty dollars a year vs. thousands. MyEclipse :: Eclipse plugin development tools for Java, JSP, XML, Struts, HTML, CSS and EJB. With MyEclipse, there’s no capital investment, no vendor lock-in, and no risk. Priced at only $31.75 for the Standard Edition, $63.55 for the Professional Edition and $158.95 for the Blue Edition (price includes a 6% processing and handling fee), MyEclipse subscribers have full access to their MyEclipse tools, all feature releases, all updates, free online support, and tutorials for 12 months. For Windows: the MyEclipse All-in-One installer is bundled with Eclipse and JRE, and requires no other downloads to get up and running. For Linux: the MyEclipse All-in-One installer is bundled with Eclipse and JRE, and requires no other downloads to get up and running. For Mac: the MyEclipse All-in-One installer is bundled with Eclipse and JRE, and requires no other downloads to get up and running.